I have another review for you today! 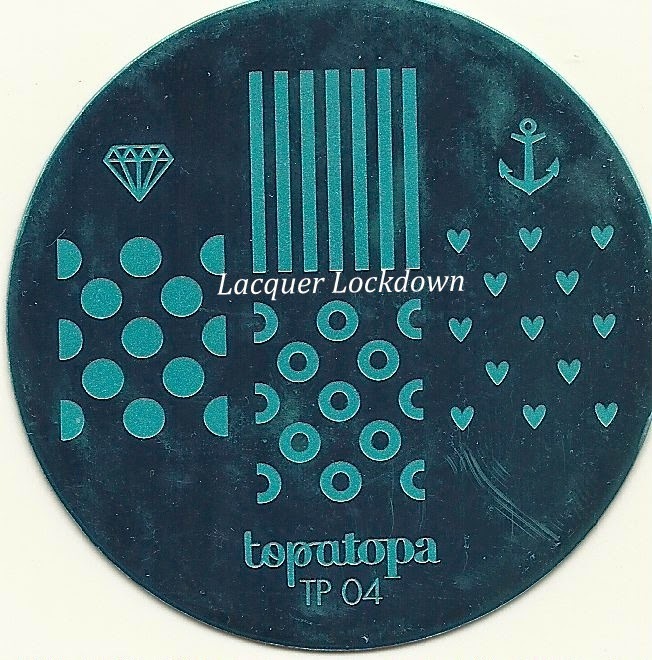 This one is for the Topatopa nail art stamping plates that I introduced here a few weeks ago. I have all 6 plates, along with swatches and relevant information regarding sizing etc as usual for my reviews. 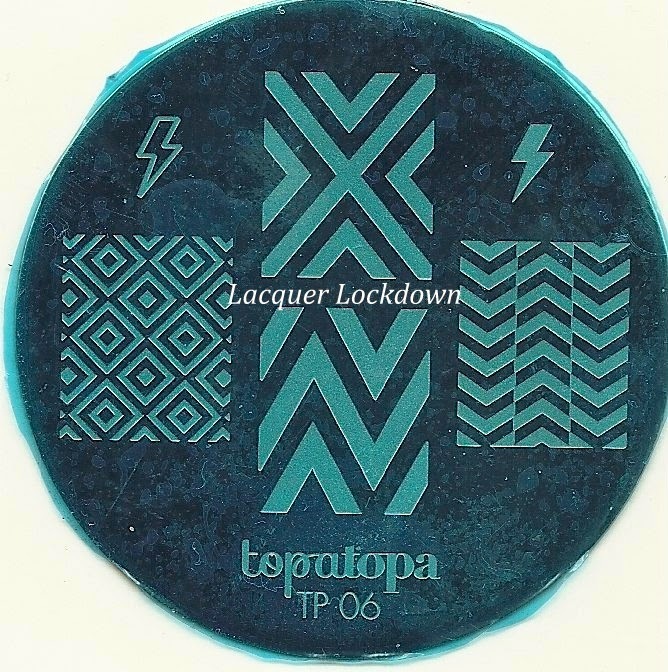 So for a quick re-introduction Topatopa is a indie brand based in France and run by the incredibly sweet Samantha. The brand is that it was named after a game Samantha and her little sister made up and played as children, but otherwise it has no French meaning. However I find the name and the meaning behind it extremely cute. As with all my reviews of a new to me brand or series I have divided up the review into relevant sections so feel free to scan through if you are looking for information on a particular subject. Again these plates hail from France. 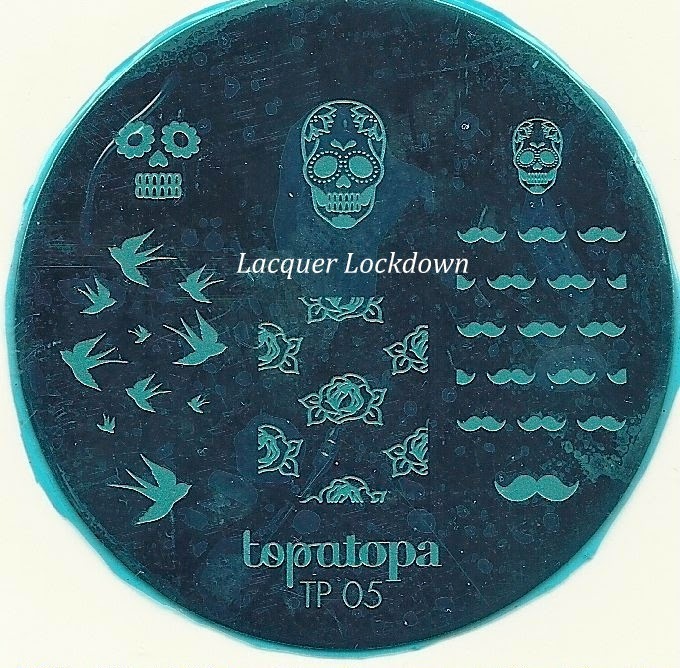 There are 6 plates that have been released thus far. 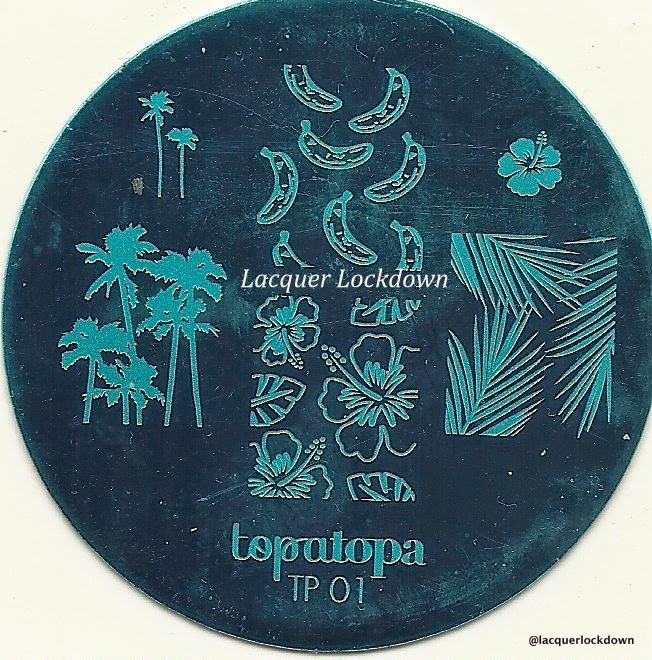 Each plate comes wrapped in the plastic blue film that most of us are familiar with, and is backed with paper vinyl depicting the Topatopa logo. These plates feature a variety of popular themes including tribal prints, nautical themes, and chevrons. Each plate measures 6cm x 6cm and contains between 6-7 images with 4-5 of those being full sized nail images and 2-3 accent images. Full sized images measure roughly 2.0cm x 1.5cm so as you can see they are a bit on the smaller side of things image wise. For those with longer nails this will require either double stamping or the use of a marshmallow stamper to stretch the image. 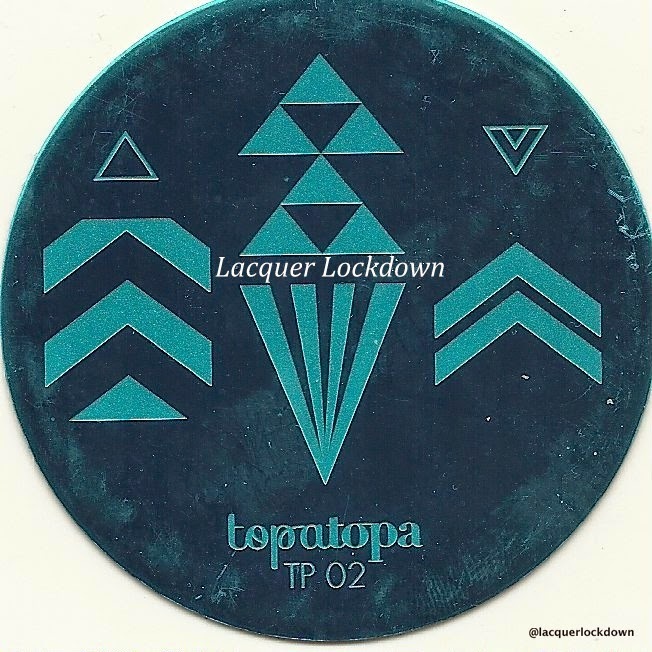 Below I have the measurement of other popular brand stamping plates to which you can compare the Topatopa image size. If you are familiar with the way I review plates then you know that I always swatch out my images with regular Wet N' Wild Black Creme nail polish and my gold standard XL stamper from Bunny Nails. I will only switch to Mundo de Unas or Konad (my gold standard stamping polishes) if I have difficulty picking up and image likewise I will only switch to a marshmallow grade stamper for the same reasons. For these swatches I had no difficulty at all with image pickup and ended up using the forementioned Wet N' Wild and Bunny Nails stamper. Any place were you saw me repeat an image was either due to mistamping on my part or because I didn't entirely pick up the image with polish. As you can see the images came out extremely crisp and transferred quite easily often on the first attempt unless I made some personal mistake. It has been a very long time since I have purchased a new to me brand without having difficulty with at least one image or plate or without requiring me to switch to a true stamping polish rather than Wet N' Wild. Frankly the last time this happened was when I purchased Messy Mansion plates for the first time. Insane right? That goes to show you that the quality of these plates is very very good. The images and cute and versatile allowing for a variety of different kinds of nail art. My only qualm with these plates is the full nail images are a little on the small side for me. I have long nails as you well know and I prefer my nails to stay that way for a variety of reasons. As I mentioned earlier if you have longer nails you will have to use a marshmallow stamper to stretch the images to fit your nails or use the decal method. Not a big deal, but it's only fair that I mention it. That aside, I'm quite pleased with this purchase. I say that while currently sporting an adorable manicure using plate TP02! When reasonable cost combines with exquisite quality and desirable images you're going to win every time with me. 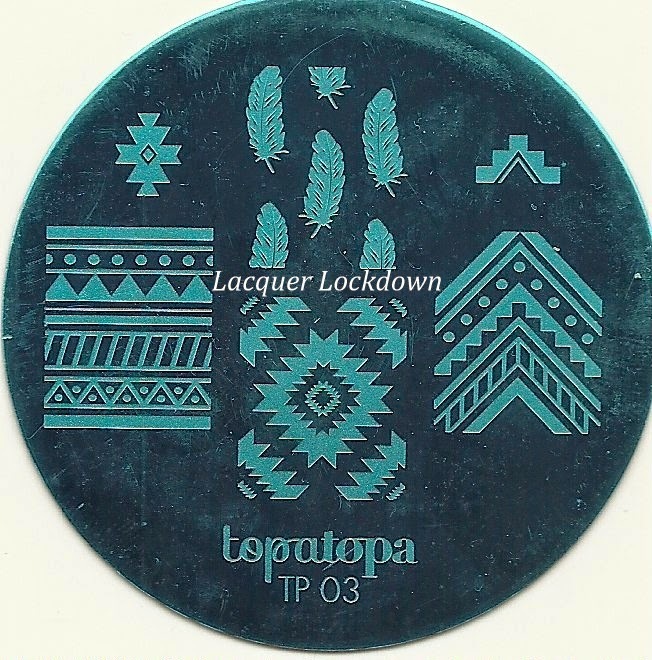 I think for any stamping fan these plates would make an excellent addition to your collection. love love love the Aztec plate!!! need! I just ordered a bunch of these! However, shipping was $20! And I have no idea how long they will take to arrive. Did they send you tracking information?